Holt Boggs will be living out of his suitcase in the heart of Texas for the next month and a half shooting back to back films. We caught up with Holt as he prepared to embark on this crazy ride leading us through the worlds of sci-fi and the paranormal. MV : Welcome to Movie Vine, Holt! HB: Thanks so much. Thank you for having me. MV: You are preparing to star in two very different films which happen to be shooting back to back. 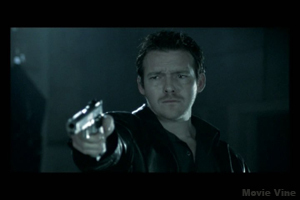 First you star as Wayne in the sci-fi feature The Underneath, and then you star as Eugene in the paranormal thriller Hostage. What first attracted you to these characters? HB: First things first, it starts with the script. I know, everyone says that and blah blah blah, but all bulls**t aside, it’s the truth. I remember something Alec Baldwin said about making choices. I’m probably screwing this up, but he said basically, you have three things to consider. Who’s the director, who else is in it, and the script. You can budge on one of those, but if you budge on two outta the three, you’re screwed. That really stuck with me, and painfully, I’ve found this to be the truth. I’ve made exceptions and I paid the price. No, nothing too obliterating to my career, but I’ve been in things I’m not proud of, or maybe more truthfully, can’t stand. Back to the question, I have to really ‘get’ the character. You know what I mean? Feel it when I read the script. On Hostage, I had been dying to work with Michael (Yurinko) for years! I was originally attached to a film he wrote, For the Love of Jade which I loved. That got shelved for a while, so that never happened. I heard he was doing Hostage, I begged to get the script. It floored me. Eugene is such a complex character. A lost soul, he’s (mentally) shot. Dealing with the brutal deaths of his wife and daughter as he’s forced to fight for what little salvation he has left as a father, this got to me. And bringing good friend and award winning actor, George Katt (House of Bodies, Turnabout) on board, I’m getting three outta three. I am so excited about The Underneath! Can’t wait!! As a kid, films like Aliens and The Thing scared the sh*t out of me, they still do, so when Brian (Jaynes) asked me to do this, it was a no brainer. I play Wayne, a newlywed on my honeymoon with my wife, played by Natalie Wilemon. She’s great by the way! We’re out camping when we get sucked into an underground cavern and realize we’re not alone. For me, I get to go back to Texas and I wish it was deeper than this, but what attracted me the most is that this is gonna be a lot of fun to shoot! Batsh*t scary yes, but fun! I’ve never done a film like this before and my goal is to give the audience something a little different than what they’re expecting. Brian and I get each other and we have a mutual trust and respect so I’m really looking forward to this! MV: Can you walk us through the difference of auditioning for a fun monster movie versus a dramatic thriller? HB: From my perspective, regardless of the genre, you have to focus on the character. I can’t work any other way. So for me, whether it’s a romantic comedy or Armageddon 9, my character has to be as three dimensional, as real as humanly possible. MV: Originally Hostage was slated for production before The Underneath, but the shooting schedule has since swapped. How have you managed to shift your focus to incorporate this schedule change? HB: To be honest, it really screwed me up for a bit but I think it’s better overall. I signed on to Hostage I think it was September last year, we were supposed to start filming in February. I start preparing for the film almost immediately. Then it gets pushed to March, then April then May and this was making me nuts! It’s actually working out much better now. Kerri Navarro and Jena Waldron were pulled in to produce so that’s off of my shoulders and I can focus solely on my performance. MV: The most important part of acting is giving life to a character, to add depth and pull him off the page. You are creating two very contrasting characters. What have you found the main difference to be between Wayne and Eugene? HB: They’re really both the same guy at their core, just dealing with different situations in their lives at the moment. Wayne (The Underneath) is having a peak moment. He just married the love of his life, the woman of his dreams and is incredibly happy as they embark on their future together. His motivation comes from his fear of losing that; he needs to protect his wife Jessi. Eugene (Hostage) is past that. He had the love, the family and the happiness and now he’s dealing with the brutal death of his wife and daughter, the loss of what Wayne has. MV: When working on creating a character do you have a special trick you use? For example, do you figure out the contents of his wallet, create his background story, or find a specific walk and dialect for him? HB: Yes and no. It really all depends on how far off the character is from me. The more different the character, the more work obviously. I always come up with a very very specific back story and for everything I do! I look at or create his life, his likes, dislikes, his relationship with his family, where he came from, what he takes pride in, you know? I get as specific as I can. Basically, look at the environment he comes from. This says so much about how he thinks and feels about everyday life. Physically, I do different things. I find a walk, a pace he moves at, if he talks with his hands, I make his habits my habits in everyday life. That way, on set those actions are now just a part of who I am and not a new action to worry about. Make sense? MV: How much of the stunt work will you able to perform yourself for each of these films? HB: I think all of it. Hostage is a definite; I’m doing all of it. For the character, I need to go through what Eugene’s going through. I haven’t had ‘the talk’ yet with The Underneath producers, but I think we both know I’m planning on doing all of my own stuff. 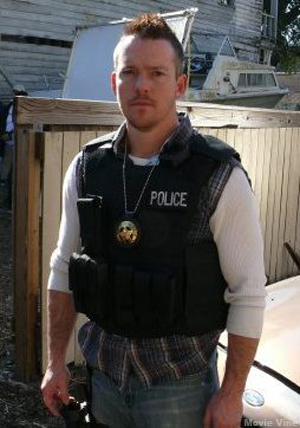 I’m working with Michael Jaynes and the same production team on both films and so I’ll be in good hands. MV: When gearing up for back to back shoots with only a week off in-between, how are you able to give 110% to each project but still keep from burning yourself out? HB: Great question and it’s definitely gonna be a challenge. I’m really fortunate because of the timing. 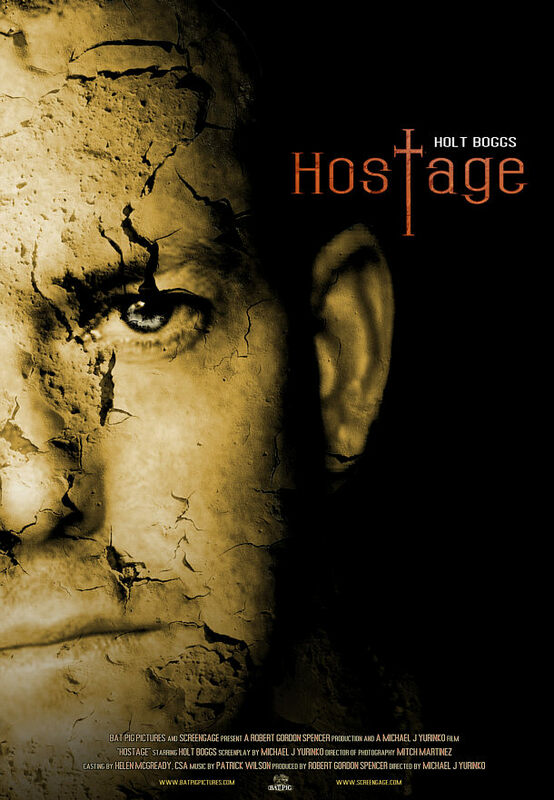 Hostage is going to be f***ing tough, well both are tough physically, but Hostage is going to be a huge emotional drain from beginning to end. Because of how long I’ve been prepping for the film, it allows me to give 200% to The Underneath. During my week off, I can focus on rest and switching gears, getting back to all the prep I’ve already done, but it’s not like I have to prep for a new film in just a week. Make sense? The different tones of the film also help. If I was doing two, really emotionally heavy films, I couldn’t do them this close together. MV: When you were first starting your career, you attended a two year conservatory program. What are some of the tools you learned that you are able to put into practice today in preparation for these roles? HB: A little bit of everything. Like anything else, you take what’s useful to you. I was really green when I studied there, so more than anything, it gave me an appreciation and understanding of the work involved in creating interesting, believable characters. MV: What advice would you give to a young actor fresh out of school? HB: Learn the business side of acting. First and foremost, this is a business. You can be the most talented actor in the world, but if you don’t understand the business side of things, your talent will go unnoticed. MV: It is easy to get caught up in the fame and fortune aspects of this industry. What keeps you so grounded especially living in Los Angeles? HB: Well, I’m not famous so that helps, but more than anything, I’m a home body. I purposely don’t live in the heart of LA and I don’t go out much. When I do, it’s a little weird. When I’m home, I spend most of my time with my wife and kids. MV: What do you find are the most interesting characteristics about life in Los Angeles? HB: I love how diverse it is! Anything goes and although that doesn’t appeal to some people, I love that! All races, religions, lifestyles and sexual orientations are here with no issues. Where else can you find that?! Oh, and the weather is awesome! MV: Even though you have lived all over the world, most of your childhood was spent in Texas. It has been 7 years since you filmed The Prodigy there. What are you most excited about in returning to the Lone Star State to film? HB: My roots will always be in Texas. All my family is there, I’ve shot there, it’s where I grew up. Let’s cut to the chase, I want some barbeque and Tex-Mex damnit! MV: So tell us the truth, is there really a basement in the Alamo? HB: No, but it’s got an amazing attic and a two car garage that no one knows about. Shhh. MV: Thank you so much for sharing with us today. We look forward to catching up with you again for an in-depth look into both The Underneath and Hostage. There are currently 1 Comment on BBQ and Tex-Mex : Interview with Holt Boggs. Perhaps you would like to add one of your own?